What to say about Organic Panic? It’s the first game from Last Limb, a group of two brothers that have finally released their first full game on the PS4 and Xbox One. In the works for five years, does this produce-centric game have what it takes to stand in today’s society? Organic Panic is a quirky platformer where instead of controlling humanoid characters, fruit and vegetables are the protagonists. Your overriding objective is to jump and climb to the black hole at the end of each level, which serves as the exit. A variety of characters, including a coconut, kiwi, and cherry are your companions, each with special abilities. Use of these special powers are required to reach the goal, as there’s generally no other way to get to the end otherwise. An extremely deep hole that blocks your way? Just fill it up with a bunch of water. Likewise, if there is a massive amount of ice that freezes you in place, you can burn a hole through it with the carrot’s flame-throwing special power. Making the correct choice is necessary, as you only have a limited amount of juice to spend on special powers. If you run out, you may either get lucky and find glowing orbs throughout the levels to replenish your amount, or you must restart the level. 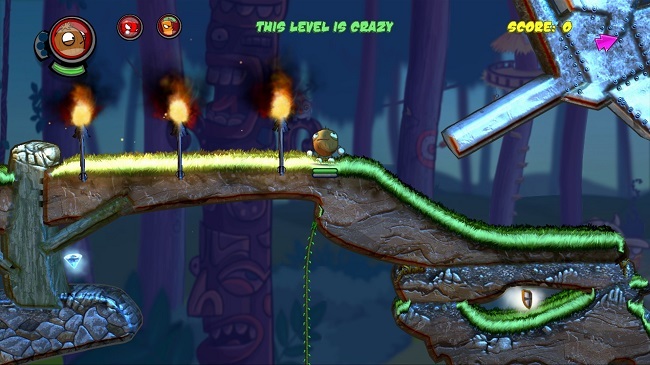 Levels are short, but there is a good amount of them in Organic Panic. Each stage has a set of levels, most which seem to fit a theme, such as ice or grasslands. 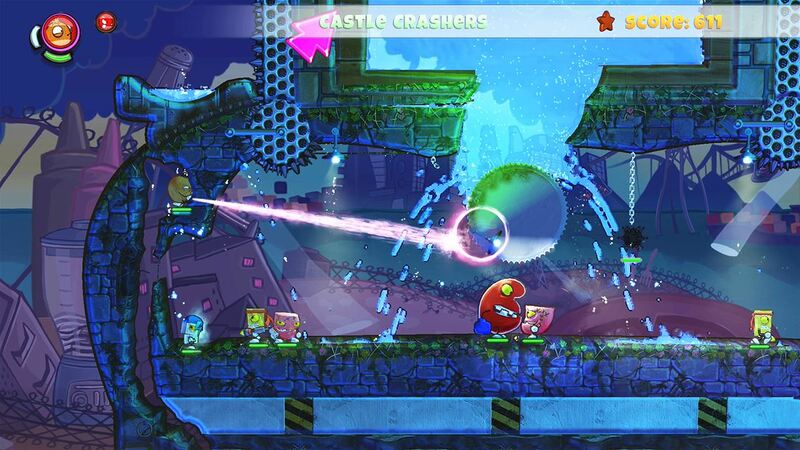 The backgrounds of each level are nice looking, with a bit of personality. The actual parts of the stage that you traverse however, don’t generally have that same level of attention. Most of the ground and metal environments look extremely generic, though that may be because of the interactivity of the place. Fortunately, ice and water look pretty, and go well with the rest of the stage. In terms of layouts, the majority of stages are designed to be challenging, but most of the time it takes about 30 seconds to either beat the stage or restart due to glitches with digging through the ground or ice. Enemy placement is generally fair, though they do entirely too much damage with each attack, that Organic Panic may as well have been a one hit to death game, and done away with the health bar. The controls in Organic Panic are strange. Before this, I had no idea that a game could feel both shockingly loose, and extremely tight in certain circumstances. The typical running and jumping that is inherent in basically all platforming games feel good, with a solid jump, and a sense of control throughout movement. That all goes out the window when the special abilities are involved. As soon as you attempt to activate any of these abilities, control goes away, and aiming becomes quite the chore. Take the fireballs that the carrot uses for example: in order to kill off the meat monsters, you need to hit them multiple times. If the control is even a fraction of a centimeter off however, the flames will go everywhere but the intended target. Or if the carrot needs to dig underground to reach its intended destination, a slight twist away will have the poor vegetable veering off to the bottom of the stage, or the entirely wrong way, forcing you to restart the stage multiple times. It’s a shame, as if the controls were a bit tighter, Organic Panic would be a whole lot more enjoyable. Pretty much all of the music in Organic Panic is unmemorable. Besides the quirky talking that the characters do in between stages, I cannot recall a single piece of music that played throughout the entire game. The story is nice, and is told through a few pages a of a comic strip each time you start the next selection of stages. The pages are adorable, quite possibly the best part of the game, and work very well for the style of game that Organic Panic emulates. Organic Panic is a game that I really wanted to enjoy. However, with controls that are unwieldy at best, and mostly boring visuals, I can’t really recommend this game to most people. If it’s on a good sale, and you want to support a new indie developer, maybe. Otherwise I’m not sure that many people would enjoy Organic Panic, other than from a story standpoint. However, if Last Limb decide to go back and tighten up the controls, then I will certainly go back for another round in the fruit pile to see if I can then recommend this quirky title. But at $15 dollars, there isn’t enough to satisfy that higher price. Full disclosure: This review is based on a review copy of provided by the game’s publisher.